Today was not a very big day. As 4th year journalism students in JOUR 4201D (science reporting), we are required to do a presentation in JOUR 4000A on our specialized reporting topic. Four of us from 4201 were able to make it to San Diego for the AAAS conference (American Association for the Advancement of Science, or, as it says on the bags they handed out, _____________, which, as I’m sure you have noticed, actually stands for ASSS, but I can see why they wouldn’t want to go with that). The theme this year is bridging science and society, an important and worthwhile goal that somehow seems to get harder and harder to achieve even as communication is refined and avenues for information sharing are built. As everything becomes more specialised, it’s hard enough to bridge the gap between different types science within the scientific community itself, to say nothing of between them and society, which can be uneducated, uninterested, or simply and understandably, distracted. 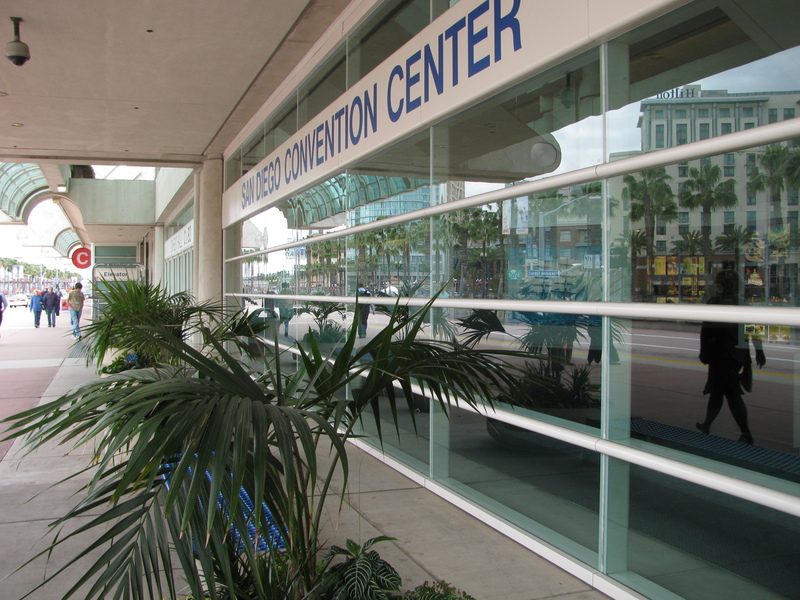 The conference involves symposia, plenary and topical lectures, specialized seminars, poster presentations, and an Exhibit Hall, and, to lucky students like us who had scored press credentials, access to the press room, and all the press briefings and free coffee that comes with. The conference begins tomorrow, and ends on Monday (the 22nd), the day we’re supposed to present. So while we were in Ottawa, prepping for the trip, the 4201 class planned how we would approach the presentation with four group members missing, and it was decided that those going to San Diego would film a short video. That video was to involve the conference and the world famous San Diego Zoo, and would be edited by Sunday in order for those back home to incorporate it into their presentation. We meant to go to the zoo today, before the conference started, and get most of the filming done. I got all dressed up in my sunny San Diego shorts and tank top, my zoo-themed parrot earings, and a lab coat, and was ready to go (I promise there will be no more talk about my clothes after today, except for when I tell you about my sweater. This is not a fashion blog). But instead, it turned out that we still had to register for the conference, so Serena and I met up with the boys and our professor, Kathryn O’Hara, at the enormous and impressive San Diego Conference Center, signed in, and collected our assorted swag. However, we waffled so long on the outside patio (and it was a gorgeous day outside, so no hard feelings there), that it was decided there was no point going to the zoo, it was too late, and we’d have to film something else. Now, I’m sure everyone has their reasons for the way this turned out, and everything ended up fine, but boy was I bitter at the time. After all, this was my last day to do anything big before the conference started, and I had already missed a day due to what I can only assume were some long-expired pot pies, and I’d done nothing but register for a conference I thought I’d already registered for, and sit around and talk. Plus, the other 4201ers were counting on the zoo. I didn’t wear this ridiculous getup for nothing! 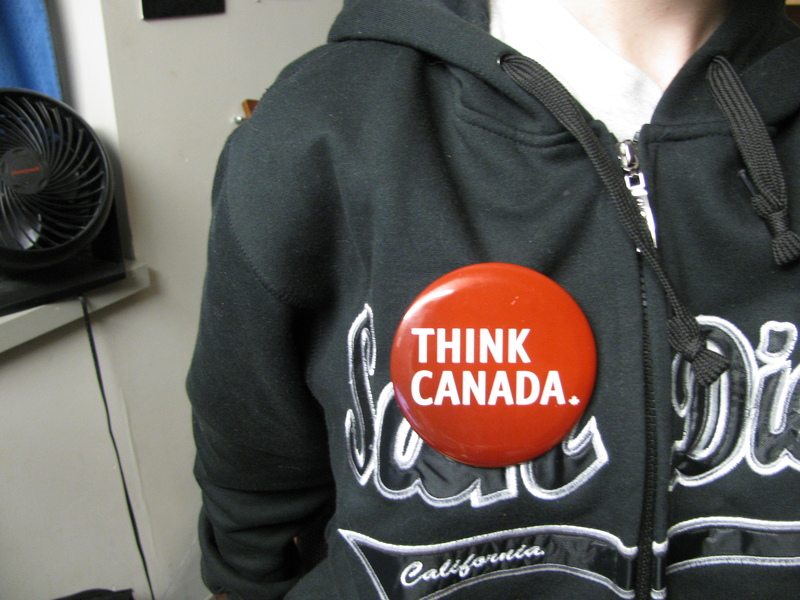 What do you want me to think about Canada? But whatever, the time for the zoo came and went, and then, at 5pm, it was time for the Canada Reception, where I caused a revolution by inciting everyone in the vicinity to eat on the floor, as the reception hall had about 4 chairs total, the view was beautiful, and the carpet was clean. Very professional we looked, but at least we were comfortable. At 6:30, we watched the opening ceremonies, and the AAAS president’s address. Chemistry Nobel Laureate Peter C. Agre spoke at the ceremony, and then it was AAAS President. And that was day one of the conference. I went home, frustrated with the lack of sightseeing, but excited about the next few days (and I planned the events I would attend during those days, and how to fit some sightseeing around it before everything was closed), and in complete disbelief that as the AAAS begins, reading week is pretty much ending, and in less than a week I’ll be back at school, trying to keep my head above water until exams.